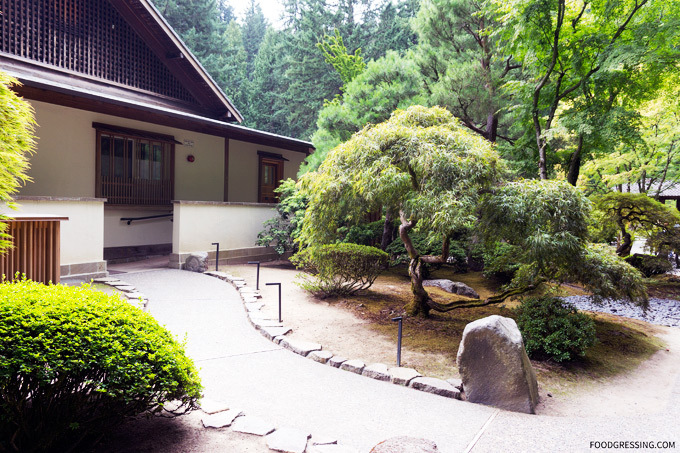 If you’re travelling in Portland and looking for a place to zen it out, the Portland Japanese Garden is great place to visit. 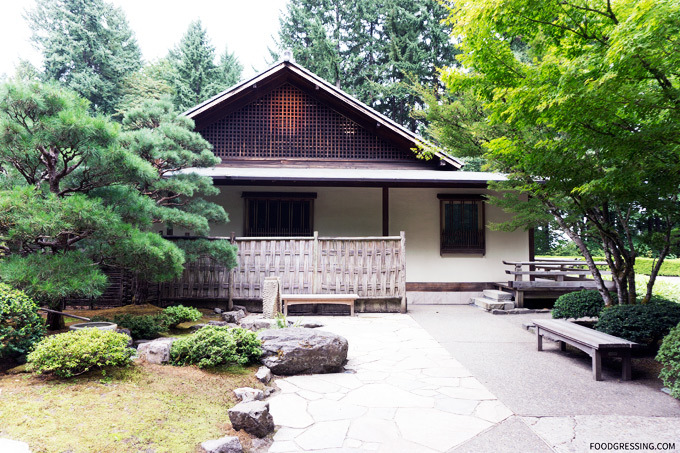 Located within Washington Park in the West Hills of Portland, the Portland Japanese Garden is considered to be one of the one of the most authentic Japanese gardens outside of Asia. Disclosure: I visited the garden as media where my admission was complimentary. 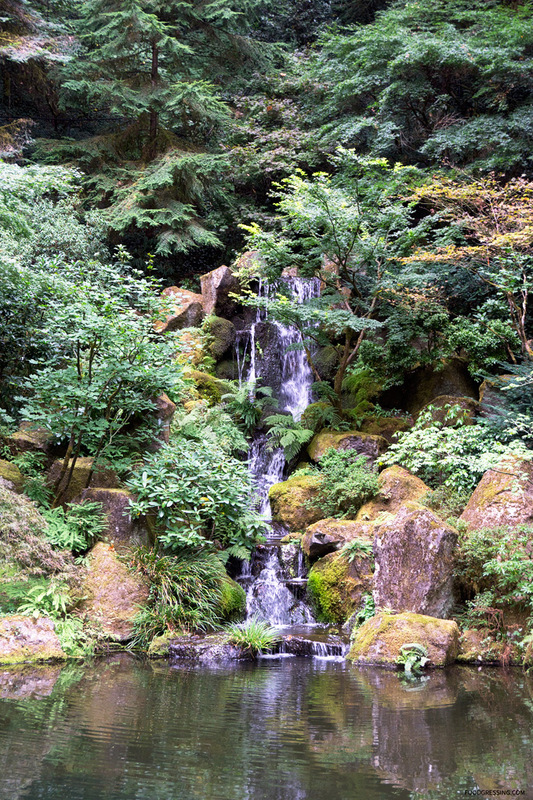 Established in 1963, the 12 acre Portland Japanese Garden features eight public garden spaces that represent different styles of traditional Japanese gardening techniques and a Cultural Village. 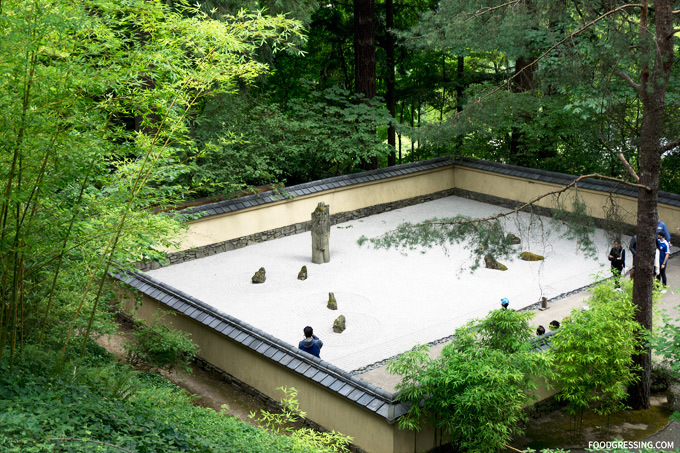 The designs of the garden incorporate essential elements like stone, water and plants that come from influences of the Shinto, Buddhist and Taoist philosophies. 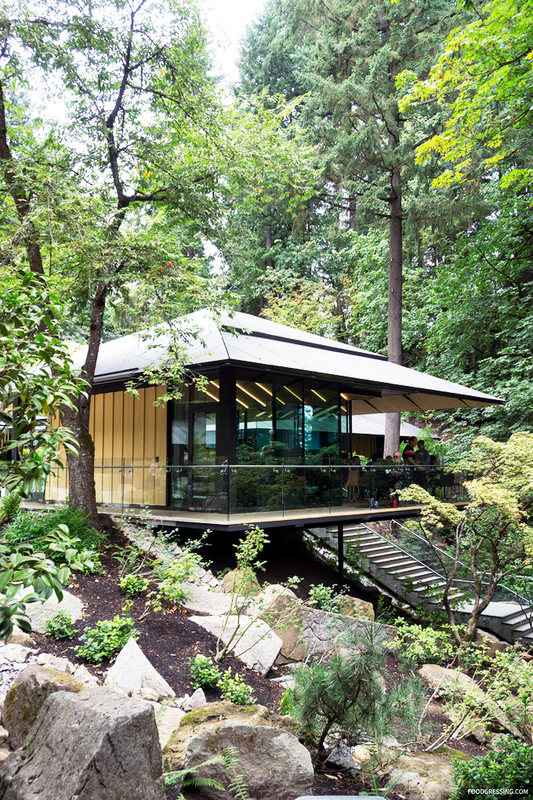 The Umami Cafe at the Portland Japanese Garden is a place for guests to relax and refresh during their visit. 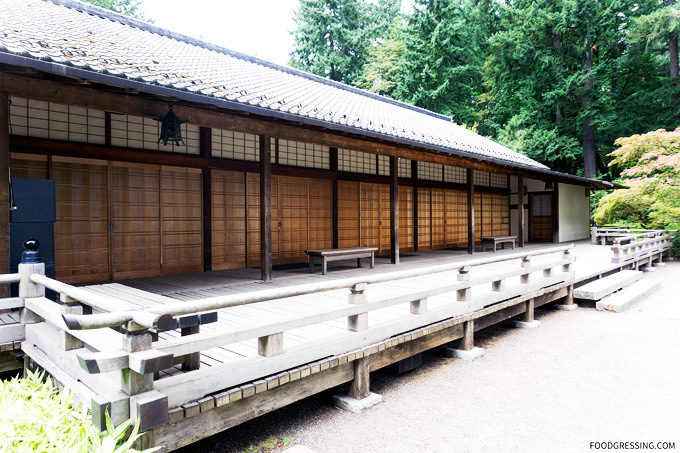 The design of the cafe is reminiscent of Kyoto’s Kiyomizu-dera temple. You’ll find tea service as well as light snacks at the cafe. As I strolled around the garden, I definitely felt a sense of serenity and tranquillity. 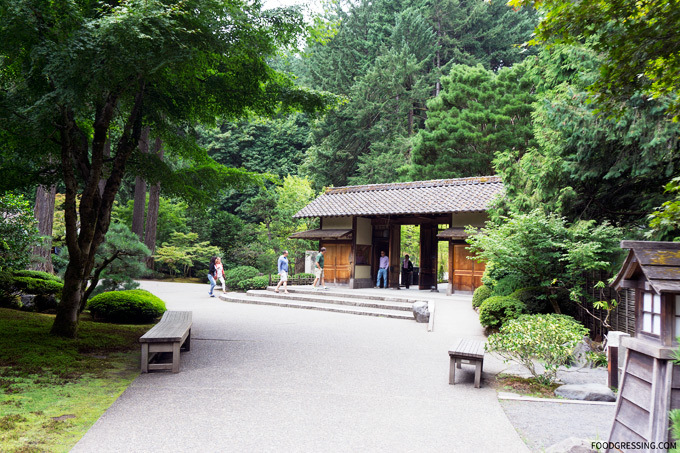 However, as the garden is a top attraction in in Oregon with 30,000 annual visitors, you might expect some crowds. Below are a few tips on how to beat the summertime crowds. 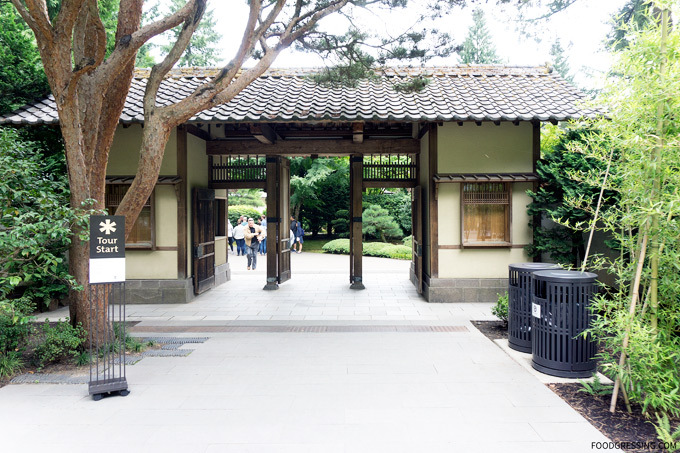 To beat the summertime crowds, consider visiting the following times: Tuesday and Wednesdays are the slowest days of the week while mornings (10am-11am) and early evenings (5pm-7pm) are the slowest times. If you get a Garden Membership, one of the perks is that you can visit during member-only hours which is 8am-10am Tuesday – Sunday. 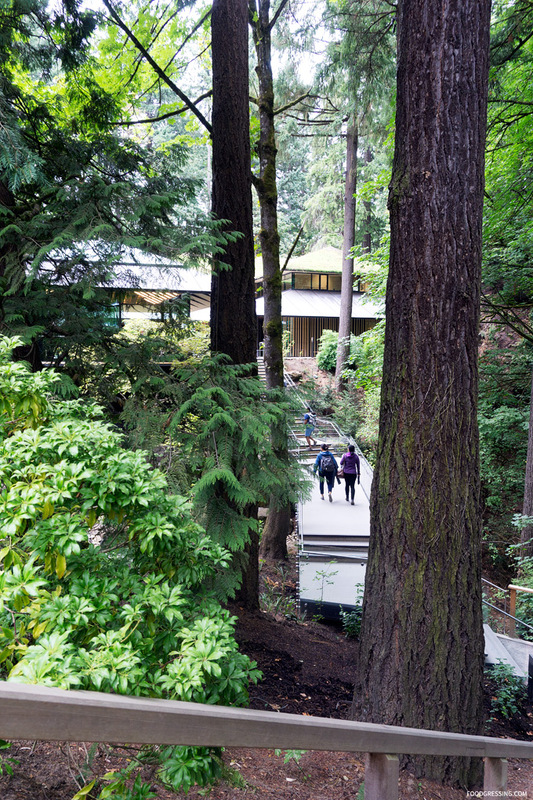 Public tours with the Garden’s well trained and knowledgeable volunteer guides are complimentary with admission. Tour times are subject to volunteer availability but are generally available at 2 pm and 4 pm May 1st through Labor Day and at 12 pm September 4th through April 30th. 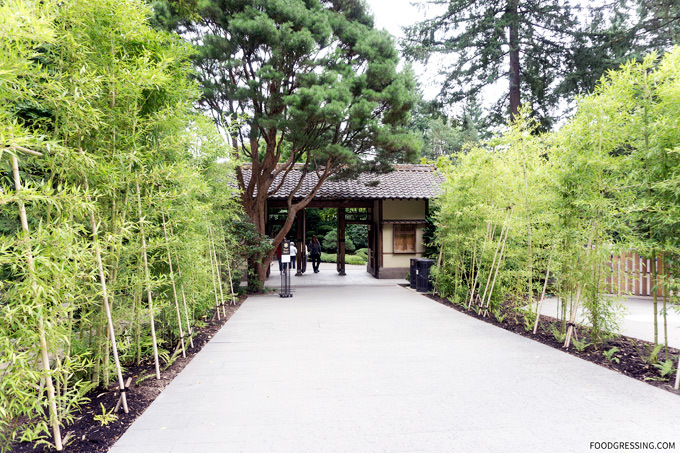 To reach the entrance to the Garden, guests can either take the scenic walk uphill and up several flights of stairs or by taking the complimentary Garden Shuttle which runs every 15 minutes. Monday: Noon – 7 p.m.
Monday: Noon – 4 p.m. 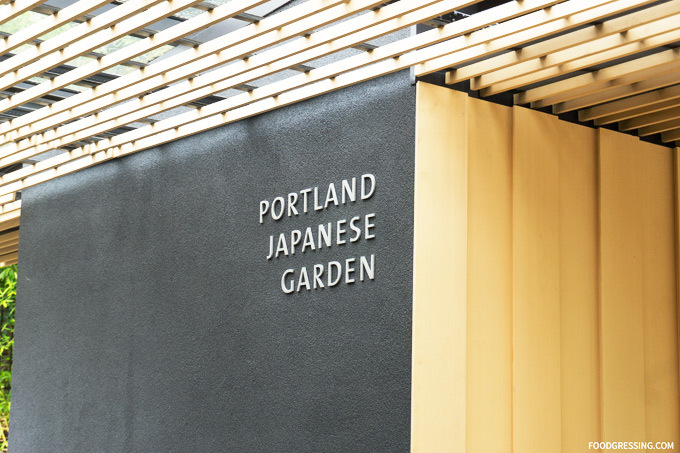 I very much enjoyed my visit to the Portland Japanese Garden and would recommend it for those who enjoy visiting garden attractions. It allowed me to tune out from the hectic, urban life at least for a short while. It wasn’t until I ventured to the US recently that I realized “healthy” bubble milk tea was a possibility. I had become accustomed to the usual processed “stuff” that had gone into bubble tea drinks in Vancouver like milk powders. In the past, I had even heard of scandals in Asia related to “fake tapioca pearls” made from old tires and shoes. You get the point. 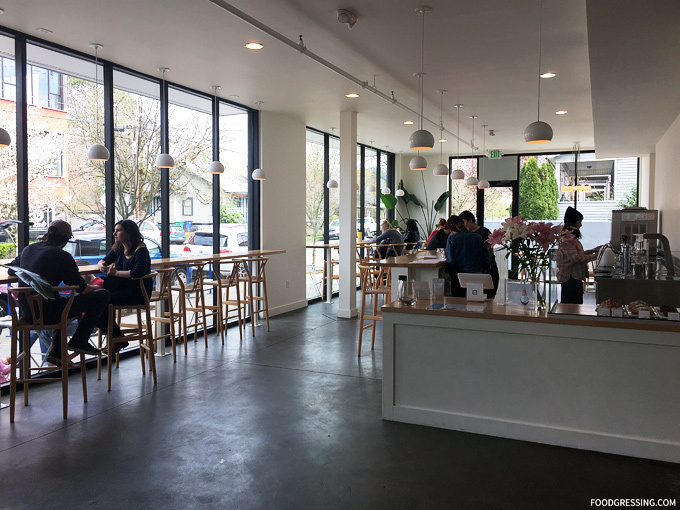 So, when I visited Tea Bar in Portland recently, it was a breath of fresh air to see a place that is committed to high-quality bubble or as the Americans call it – boba – milk tea. Note: My drink was not sponsored. This review is done anonymously. 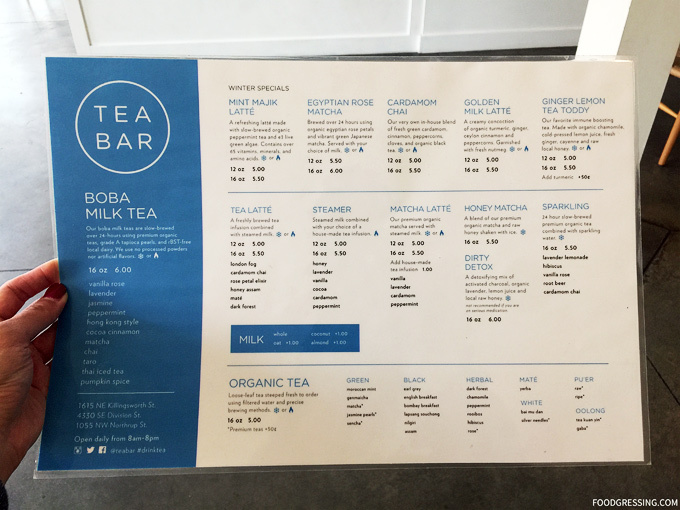 Tea Bar is a successful, locally owned chain with three locations in Portland. I visited the SouthEast Division location this past March on my way back from a road trip to San Francisco. 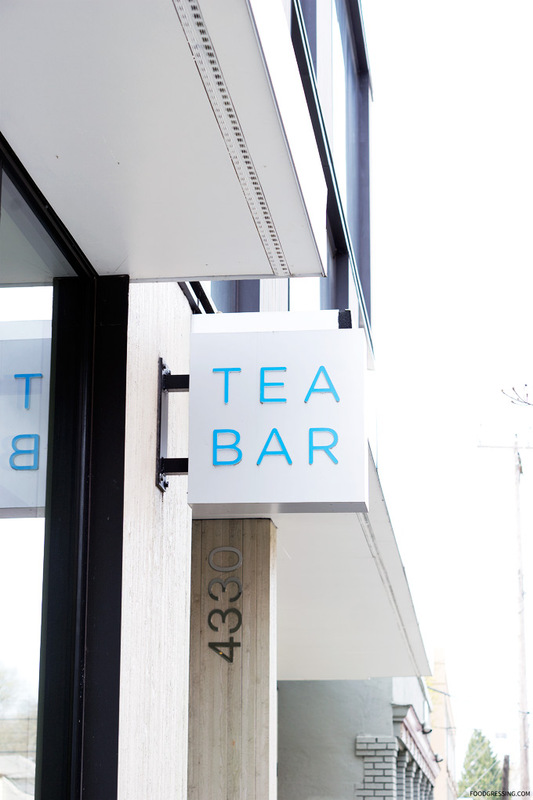 The interior of Tea Bar had a clean, minimal aesthetic which looked just like the brand image that their very appealing Instagram account (@teabar) conveyed. It definitely had more of a hipster coffee shop vibe than your typical Asian bubble tea house. 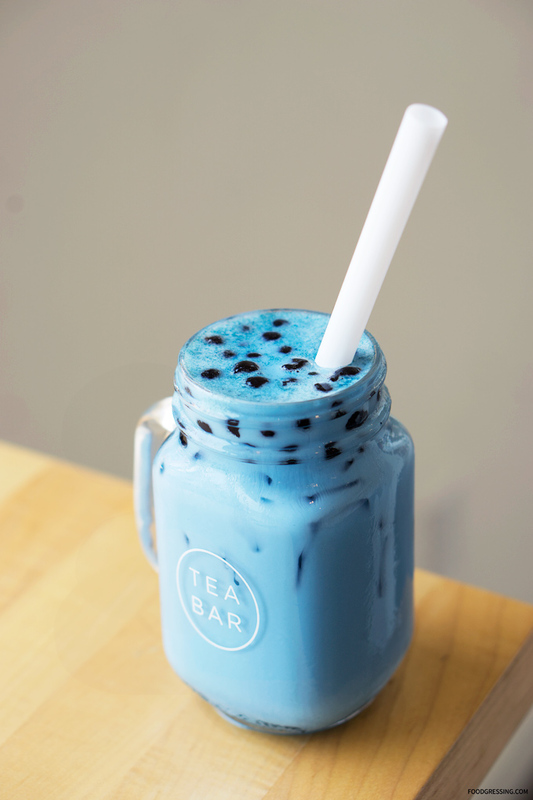 Tea Bar’s boba milk are slow-brewed over 24-hours using premium organic teas. They also use grade A tapioca pearls, hormone-free dairy, no processed powders and no artificial flavors! I honestly never knew tapioca pearls to have a “grade” but there is apparently such a thing. 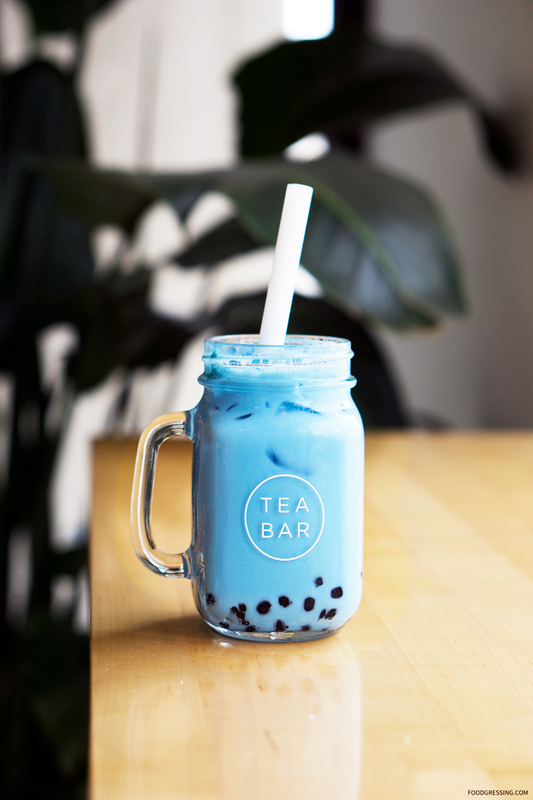 Their menu is divided into basic milk teas (like lavender, jasmine, peppermint and more) to more speciality milk teas (like Golden Milk Latte, Egyptian Rose Matcha and more). Drink sizes are 12 or 16 oz and priced around $6. They use whole milk but offer alternative choices like coconut, almond and oat at an extra cost. I ordered just one drink at Tea Bar and it is probably the most exotic yet healthiest boba milk tea I’ve ever had. It was the Mint Majik Latte made with slow-brewed organic peppermint tea and e3 live green algae. Apparently, it contains 65 vitamins, minerals and amino acids! I ordered the 12 oz ($5.00) with tapioca pearls (extra cost). It was served in a mason jar. I loved the vibrant blue colour which was very Instagram-worthy. In terms of taste, I found it to have just a hint of peppermint but mostly of floral notes. Very refreshing and tasted pretty natural for what it is. I would have it again. Ken’s Artisan Bakery has been consistently named as one of the best bakeries in America by the likes of Food & Wine, New York Post, The Daily Meal, and Travel + Leisure. 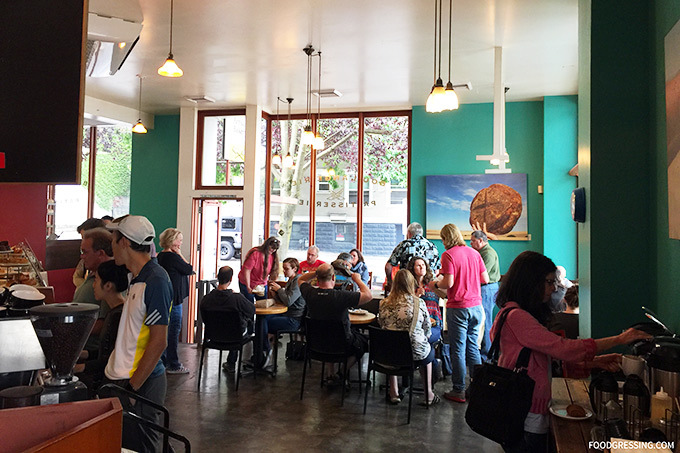 Located in Portland’s Northwest neighborhood, Ken Forkish left a twenty-year career in the tech industry to open this bakery in 2001. 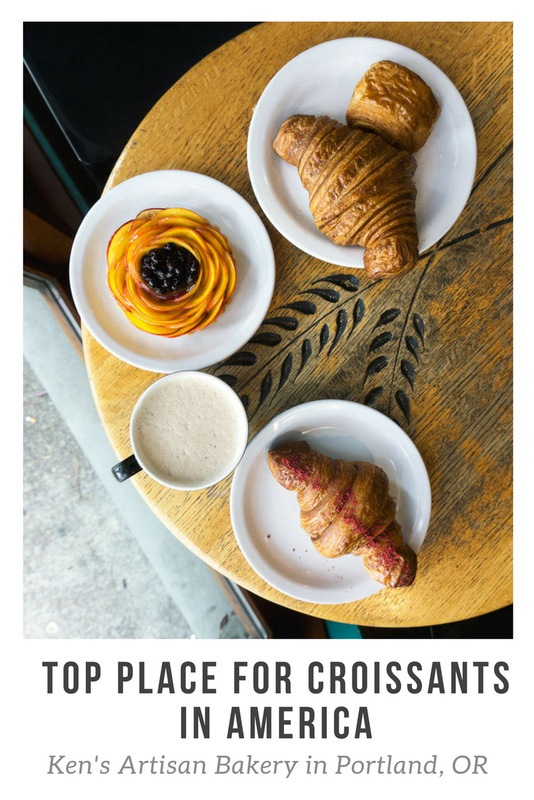 I had come to know about Ken’s Artisan Bakery when they were named for serving one of the Best Croissants in America. 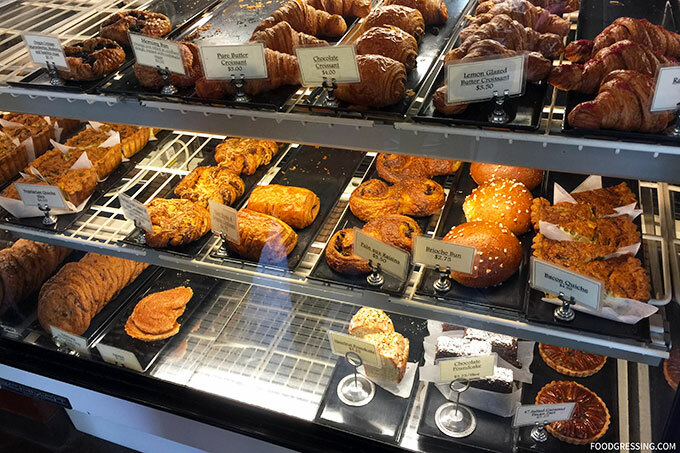 So while I was in Portland this past fall, I decided to check out Ken’s Artisan Bakery and try out some of their famous baked goods. Note: None of the food and drinks in this review were complimentary. This review is done anonymously. Opinions are my own. I must say that for a bakery that has received so many accolades the interior of Ken’s Artisan Bakery is pretty ordinary. It’s your typical neighbourhood cafe with dining tables for two, a communal table and a few tables outside. Too bad there wasn’t much more put into the design of the space such as to add more character to such a praised bakery. Ken’s lineup of baked goods includes rustic artisan breads, croissants, brioche, fruit tarts, cakes, cookies, sandwiches, salads and more. They serve Stumptown Coffee. The wait was worth it as everything tasted ah-mazing! I ordered the Plain Croissant, Pain au Chocolate, Raspberry Rose Croissant and a Blueberry Nectarine Tart to share with my family. 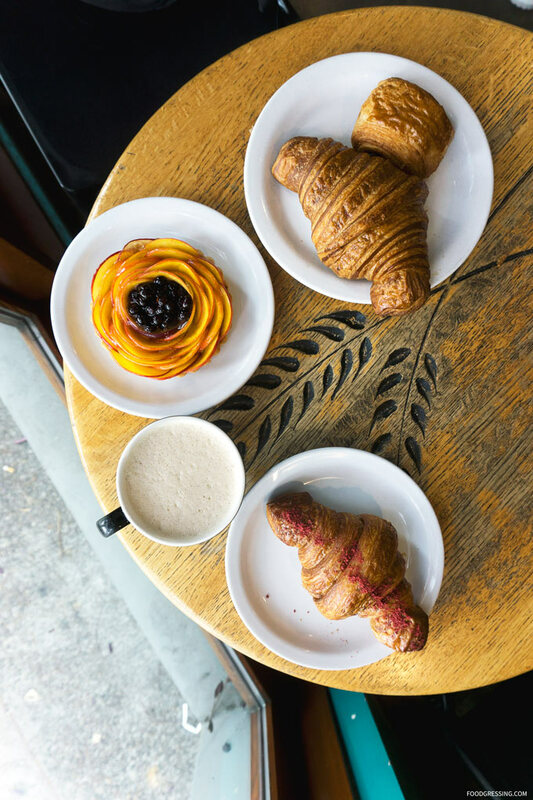 The croissants really hit the spot with their beautiful flaky layers, buttery goodness and crispy golden shell. The Blueberry Nectarine Tart has a fresh fruit filling with the perfect sweet glaze and butter crust. I also appreciated how beautifully presented it was. I also ordered a Chai Latte which was pretty good: hot, creamy, fragrant and a bit spicy. When it comes to dining out while traveling, I probably wouldn’t think about visiting a ramen house. So when I came across a ramen restaurant being named by Bon Appetit to be in the top 50 Best New Restaurants in America, I had to reconsider. 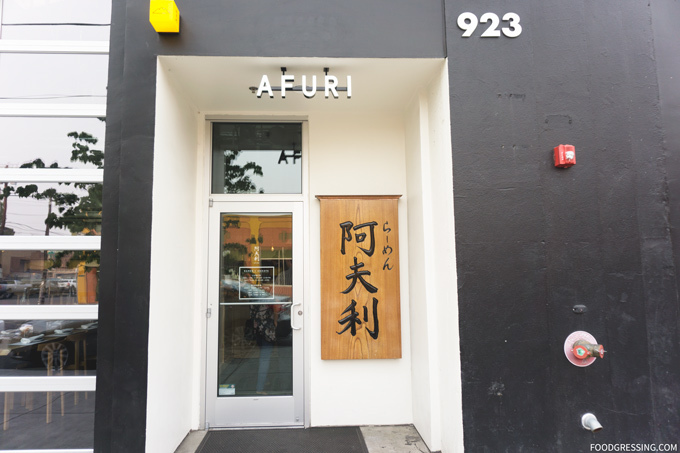 Afuri is a popular Tokyo-based ramen chain which expanded to the US over a year ago with a location in Portland. 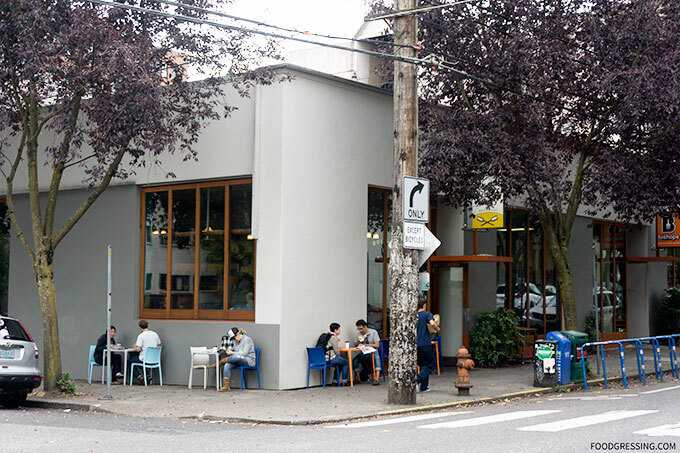 Reading about Afuri PDX and what they had to offer intrigued me so my family and I visited the restaurant this past fall while we were in Portland. 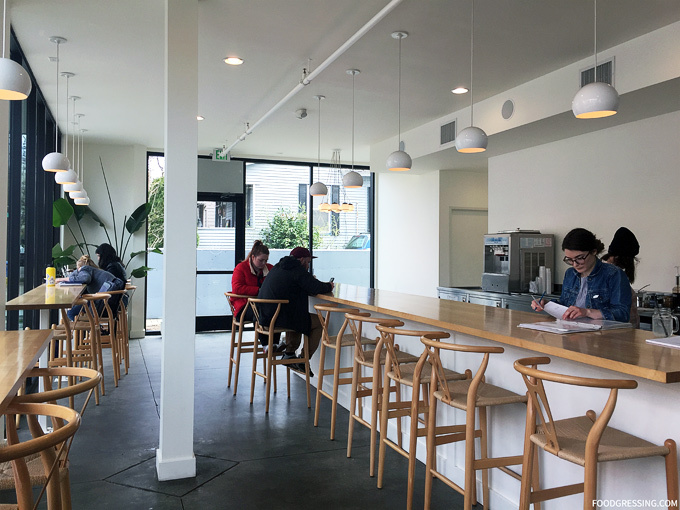 Before I visited Afuri PDX, I read Eater Portland’s insightful article on “11 Things to Know About Afuri Ramen Before You Go.” It’s a great read and I recommend it for any first-time visitors. Some of the things I learned were about Afuri’s style of ramen, some of their unique offerings and why they chose Portland as the location of their first US expansion. 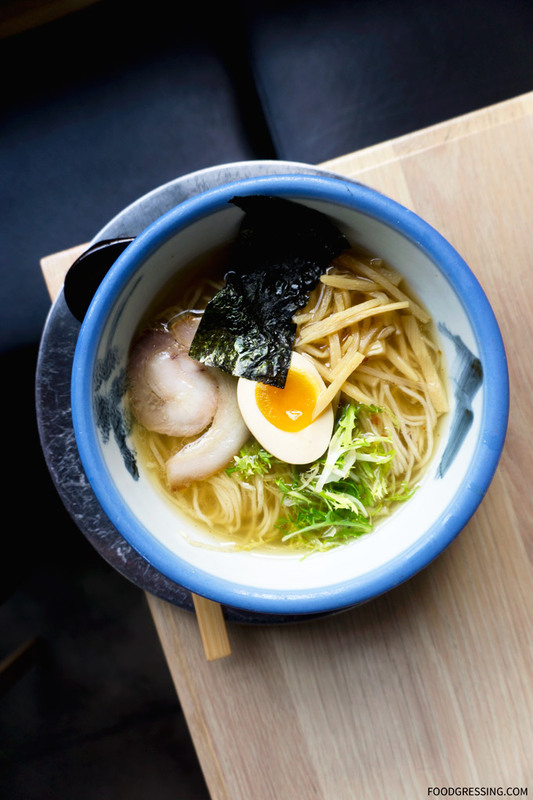 To start, Afuri specializes in Yuzu-style ramen featuring a clear broth (“chintan”) made from chicken. This is in contrast to the Tonkotsu-style ramen which has a thick, milky and rich broth (“paitan”) made from pork bones. The difference between “chintan” and “paitain” is that the “chintan” broth is produced by heating at sub-boiling temperatures while “paitan” broth is made at a higher temperature with more vigorous boiling. The lower cooking temperature for “chintan” allows fats to separate cleanly from soup and then be removed; this results in a clear broth. The higher cooking temperature in “paitan” emulsifies fats of the pork bones imparting more richness to the broth. 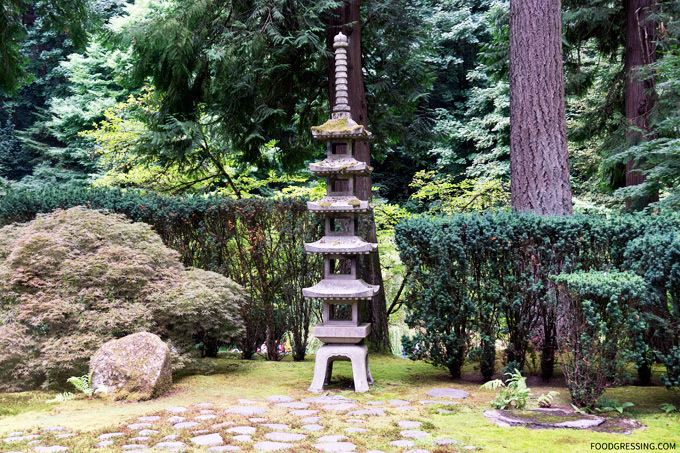 Portland was chosen as *the* first place to expand outside of Japan because of their water. After exploring possibilities in other US cities, Afuri liked Portland’s soft water at pH 7.5 the most because it can absorb more flavour. Hard water, in contrast, takes the flavour out. Afrui PDX offers three clear broth ramens with different seasonings. There is Yuzu Shio (salt), Torigara Shoyu (soy) and Yuzu ratan (spicy soy). They also offer Tonkotsu Tantanmen (pork broth with spicy sesame miso), Truffle Miso featuring 8 month aged black bean miso (vegan option) and Tsukeman (cold dipping noodle options). Aside from ramen, they also have their own in-house sushi chef, a genshiyaki grill for making skewers and a wide selection of sake. 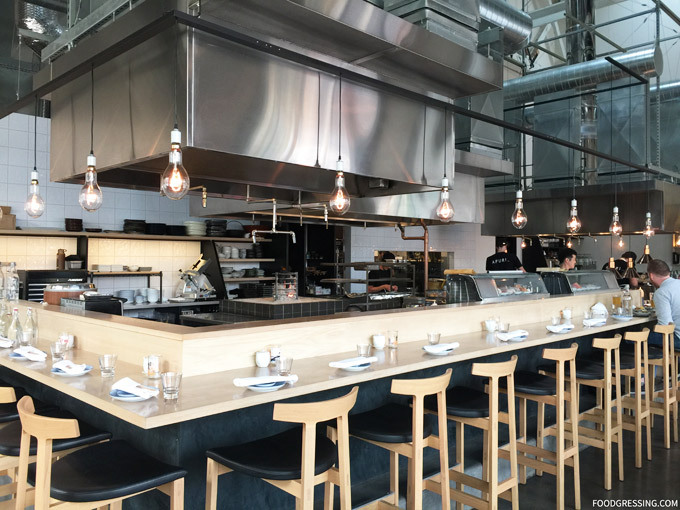 Located within a former warehouse, it was an eye-opening experience to see such an industrial chic space used for a ramen eatery. 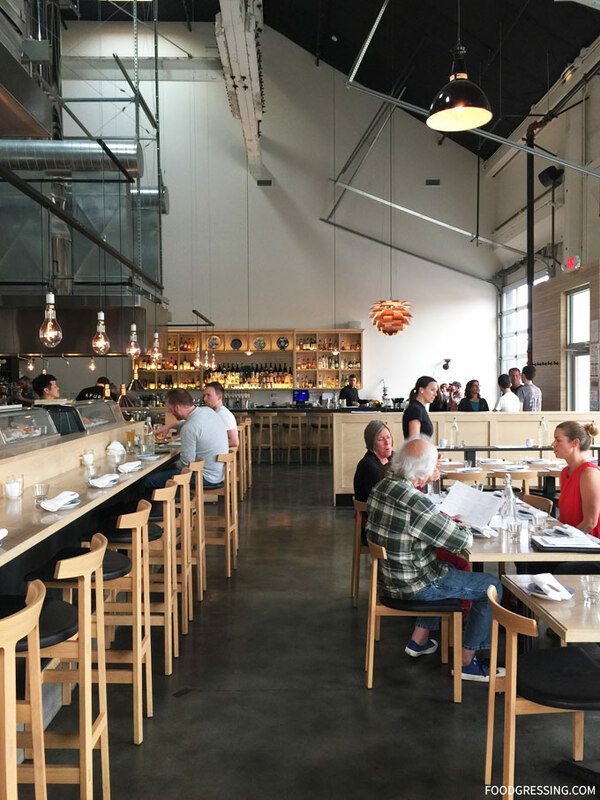 The 90 seat space has a mix of white oak dining tables and seating by the bar. It’s a bright and airy space with industrial lights hanging from the tall ceiling and a concrete floor. My family and I just shared a few dishes as we weren’t too hungry from eating earlier. 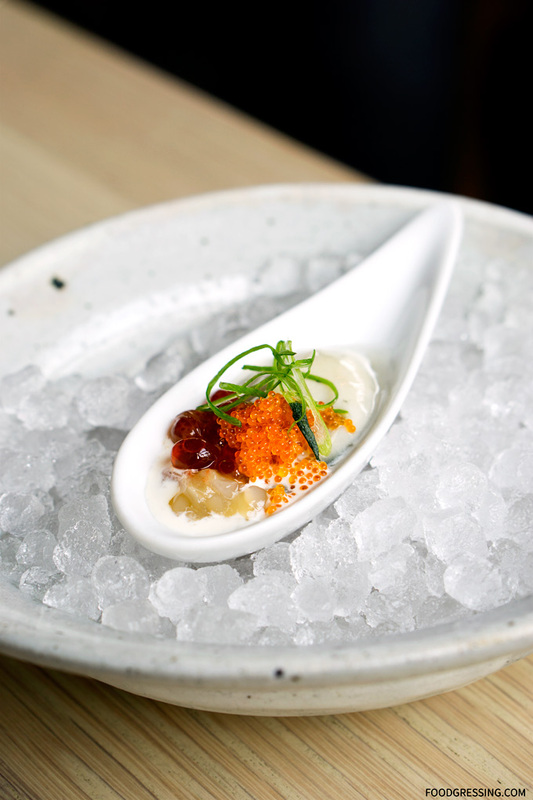 To start, there was the Chef’s Spoon ($6) with dashi soy cured oyster, snow crab, celery root puree, ikura, sudachi, and scallion. I thought it was very refreshing and not too “taste-of-the-ocean.” It was delicate and I enjoyed the balance of flavours between citrus and seafood. The ikura added some interesting “popping” textures. Next was the very Instagram-worthy Housemade Tofu ($8). 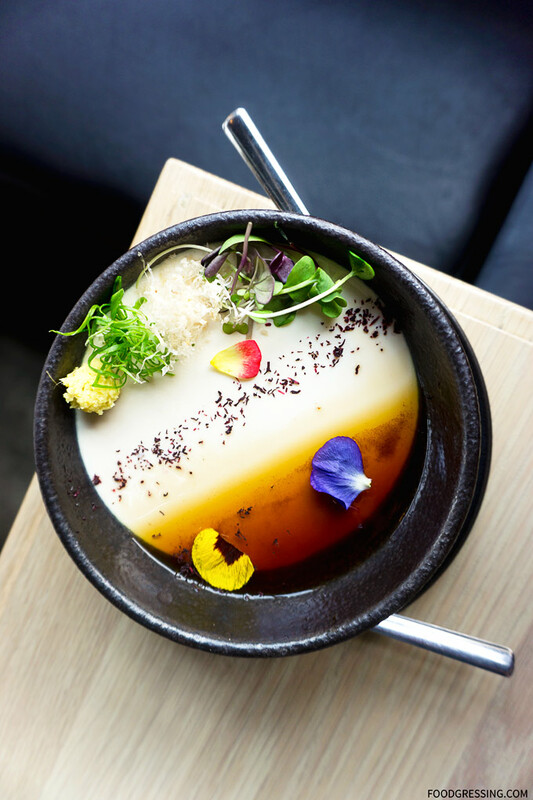 Have you ever seen such a pretty tofu dish? It’s gastroart. The tofu was silky smooth and heavenly. Other ingredients were dashi soy, ginger, scallion, bonito flake, yukari salt, and microgreens. And then there was the signature Yuku Shio ramen ($14). The yuzu is apparently sourced from a producer in the village of Umaji, Japan. The ramen came with chashu pork, egg, endive, bamboo shoot, yuzu citrus, garlic, and nori. The light-colored broth had some nice citrus notes which is quite different from a thick, creamy Tonkotsu style broth. My concern, however, was the portions which seem a bit little for the price. There was only one slice of chashu which was quite small and just one peace of seaweed. If I were really hungry, I would definitely need 1-2 more pieces of chashu. The ramen egg had a reasonably runny centre.